Mr Monkey travelled into Manchester on the 192, and scampered along to the press night of Happy Days at the Royal Exchange Theatre. Happy Days was Beckett's sixth play, written between August 1960 and May 1961. He described it as "all poised on a razor-edge and no breathers anywhere". The play begins with 50-something Winnie trapped up to her waist in a mound of sand. Her husband, Willie, is slightly less trapped in a hole behind her, from which he does his best to ignore her. The play is fundamentally a monologue by Winnie, with pauses in which Willie fails to respond to her. She examines things taken out of her large black bag, explains her daily routine (which starts and finishes with the ringing of a bell), discusses the "happy days" in which Willie actually replies to her, and recounts strange tales of childhood, first love, and a conversation with a passing couple. She also toys with a revolver, has her parasol catch fire, and runs out of patent medicine. More or less the only thing she doesn't talk about is the reason she's up to her waist in sand. By the second act, only her head is visible, and she is more distressed. In this production, Winnie is talking into a small camera with images displayed on monitors above her head throughout the second act. This production of Happy Days has possibly the most alarming scenery seen at the Exchange for some time. The mound of sand and grass that Winnie is trapped in occupies almost the entire stage, dominating the Theatre. There's a circle of water around the base of the mound. 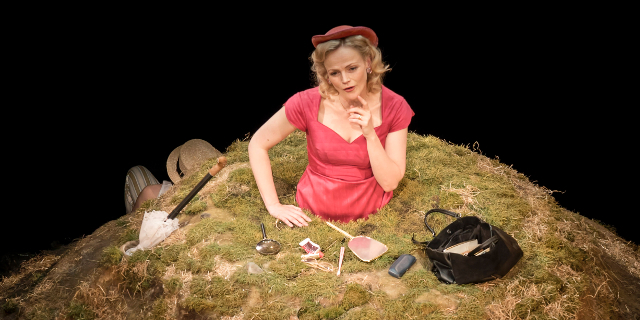 To enable the play to work in the round without half the audience complaining about only seeing the back of Maxine Peake's head the entire stage rotates slowly for the entire duration of the play. Mr Monkey found this a bit disconcerting at first, but it fitted in perfectly with the strangeness of Winnie's situation. The lighting is quite aggressive at times, and a loud and harsh bell repeatedly wakes Winnie whenever she closes her eyes in the second act. 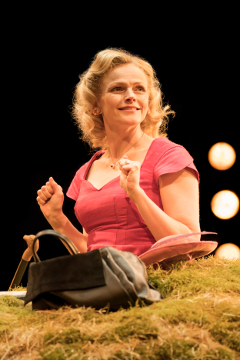 Obviously, any production of Happy Days stands or falls on the performance of Winnie, and in this production Maxine Peake is brilliant, a perfect depiction of someone trying to appear cheerful while everything falls apart around her. She's so convincing that Mr Monkey very soon accepted her completely bizarre situation as completely normal. David Crellin, as Willie, is as effective as the role allows. Mr Monkey enjoyed this production of Happy Days. He was, it's true, never quite sure whether Winnie and Willie were in Hell, Limbo, or trapped in a metaphor of a stagnant marriage, but that didn't seem to matter until he thought about it on the bus home. He recommends Happy Days to people who want an intense and rather inexplicable evening out. Happy Days runs until 23rd June 2018.